The history of shawl industry in Amritsar, though obscure, is of considerable interest. Amritsar has been known for Kashmiri shawls. The historians claim that these shawls, which were valued for their ingenuity and beauty, were introduced into Punjab by weavers who had migrated from Kashmir because of high taxation on Jamewal shawls imposed by British during the 19th century. The city once used to be the favourite destination of Kashmiri shawl weavers, who would come down to the city from the picturesque valley every winter. Earlier, the Kashmiris used to come in thousands. Now, their number has been reduced to 150 only. 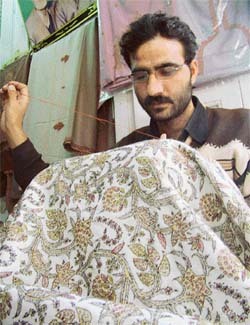 The Kashmiri weavers have rented shops mainly at Sirkibanda, Shakti Nagar and Puttalighar areas of the city. Mr Raj Krishan Khanna, Swadeshi Mills: "It is the moral duty of a manufacturer to stamp according to the fibre. Then comes the duty of enforcement agencies to carry out random sampling to discourage unscrupulous manufacturers, who want to mint money at the cost of the reputation of the local shawl industry, which has lately been recognised as a big production base." History repeats itself, albeit with a difference. And when this "difference" is "dramatic", it becomes all the more alluring, as shown by the brilliant performance of a play based on Mahatma Gandhi's life. The Border Security Force (BSF) jawans gunned down at least 16 intruders, including 14 Pakistani nationals, since January this year. The intruders were attempting to illegally cross the barbed wire fence on the Indo-Pak border. The most vulnerable areas where intrusions took place were villages along the border cities of Gurdaspur, Ferozepore, and Faridkot, besides Amritsar. The Punjabi poet Dev Dard has an unusual hobby - collecting rare coins, antiques, jewellery and handwritten manuscripts of historical importance. He has a collection of old pamphlets and literature written in Urdu language by the country's freedom fighters. He has in his possession old maps of the walled city and the holy city printed on cloth pieces. Singapore Airlines (SIA) has announced the change of timing for its flights between Amritsar and Singapore. The new timings would be effective from December 5, 2004 to February 15, 2005. 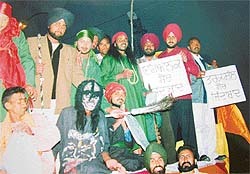 The Taraksheel Society, Punjab, has exposed as many as 500 cases of superstitions from the three border districts of Amritsar, Gurdaspur and Ferozepore since its inception in 1983. The society organises plays with scientific themes to educate the masses about the 'reality' of superstitions. The Chinmaya Mission here has set itself to the task of the rescue of needy widows. The mission took up the project of providing free monthly-ration to more than 200 widows a couple of years back. Who says that the evening of life has to be spent in retired seclusion? At least the septuagenarian Sampuran Singh does not subscribe to it. At the age of 74, this resident of Miana village in Hoshiarpur district, finds his fulfillment in visiting villages to motivate people to pledge their eyes and organs for donation after death. It was all shimmer and glitter. The country's branded jewellery-maker, the Tanishq, recently brought the world's most expensive (as they claimed) diamond jewellery items for display at their showroom here. The senior business executive of the company, Mr Alok Bodani, got these 21 items from the Diamond Trading Corporation of South Africa. Postgraduate students of Government Medical College here are a worried lot, as the government has failed to transfer 24 teachers back to the college. These teachers were transferred to Faridkot Medical College on October 22 this year for inspection (that was later postponed) of the Faridkot college by the Medical Council of India (MCI). These teachers include professors and associate professors who were heads of various departments at the medical college here. Mr Asunil Kumar, an employee of the local deputy commissioner's office, was awarded the President of India's bronze medal by Punjab Governor, Gen (Retd) S.F. Rodrigues, this week at a ceremony organised in Chandigarh. He was given this award for his outstanding contribution during the 2001 census operations in Punjab. Cooper Road’s hotline power connection? Unscheduled power cuts have become a way of life in the holy city. Residents here suffer as many as six hours of power cuts daily. Not only domestic chores are affected but also commercial establishments have to bear the brunt. Earlier, Maharaja Ranjit Singh had received shawls from Kashmir as a part of a treaty. "Travels in the Himalayan Provinces" by Moorcraft (1819-25) mentions this. During his journey, he found that Amritsar had become an important centre of shawl industry owing to migration of a large number of Kashmiri craftsmen from their region to escape the Afghan tyranny. Though weaving together of the warp and the weft into a fabric has been a source of wonder for human mind, yet history points out that shawl industry flourished in the region wherever it got political patronage. The shawl industry found mention in the memoirs of Mughal rulers and British travellers who pointed out that the industry touched its peak during the times of peace and tranquility. The displacement of Kashmiri shawl weavers and embroiders in the late 18th century to Amritsar and possibly to hill states of Kangra was due to the tyranny of Afghan rulers. Punjab, the Land of Five Rivers, had been an attraction for foreign invaders since the year 712 A.D. The migrants brought with them not only their hardy spirit but also the nomadic skills of weaving ornamented textiles and decorated hangings. It attracted people from the Central Asia where life was much harsher. Punjab absorbed the cultural traditions of the people who passed through it. The urge of Punjabis to reflect the landscape, the flora and fauna, the varieties of seasons and the moods of the day on to the shawls resulted in the development of patterned shawls. The folk traditions of Punjab were rich and vibrant. Until the beginning of the nineteenth century, Punjabis were open to raids, and the phrase "Khada Pita Lahe Da, Te Bake Ahmed Shahe da" (whatever you eat and drink is yours, everything else belongs to Ahmed Shah Abdali of Afghanistan) was quite common. Amritsar, which was a flourishing shawl market in the pre-Partition days, was hit hard during the Indo-Pak wars of 1965 and 1971, and later the twelve years of militancy. But these days are considered as the "Golden Era" for shawl industry in Amritsar which has attracted a large number of foreign buyers. 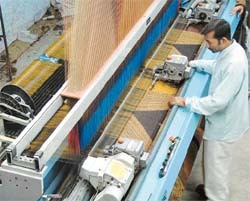 The annual export of shawls from Amritsar and Ludhiana has been estimated at Rs 500 crore. Amritsar is now focusing attention on Australia, Europe, Japan, the Middle East and the USA markets. Even the shawls sold in Himachal as "Kulu shawls" are manufactured in Amritsar. Though Amritsar has established the reputation for quality shawls, yet the large-scale production of "duplicate" or "sub-standard" shawls may mar the reputation, if enforcement agencies fail to check this trend of selling "duplicate" items. The city, which has earned a name for itself in textile goods, is also infamous for copying brand names. You name a popular brand and its duplicate is available in Amritsar. The shawls, made of viscose material which costs about Rs 100, could be sold for Rs 600 or more by passing them off as pure wool shawls. "This trend may make Amritsar shawls lose their standing in the market. You cannot cheat foreign buyers for long," cautions Dr S.K. Chaudhury, Area Director, India/South Asia, Wookmark. Dr Chaudhury said that lately Indian shawls had become an international fashion accessory and that had given an unexpected boost to exports from Amritsar and Ludhiana. Earlier, the foreigners were not much aware of shawls. Now, with sustained efforts, big departmental stores in foreign countries, prominently displayed shawls. The smaller sized shawls have caught the attention of younger generation in foreign countries. He, however, warned that the shawl manufacturers would have to ensure quality and maintain the faith expressed by the foreign buyers. Earlier, the carpet industry of Nepal which attracted foreign buyers had fallen on bad days, as the "over-ambitious" manufacturers had started minting money by exporting sub-standard material. "You cannot sell wool in the name of pashmina any longer," says Mr J.S.Madan, Founder-Chairman, Shawl Club (India). He added that the premises of many manufacturers who used brand names illegally had been raided in the past. He said there was an urgent need to enforce the act to check manufacturing of "duplicate" shawls. The enforcement agencies should come forward to book such unscrupulous manufacturers. "The manufacturers would have to upgrade the machinery and the technology to meet the global demand. There is an unexplored market of shawls in the USA and other European countries," he added. According to Mohammad Bhutt (60), who has been coming here every winter from the valley since his childhood days, they were not getting adequate remuneration for their work. Nostalgic about the past, he said Kashmiris used to work from one to seven years on a single shawl which would fetch up to Rs one lakh. Now, there is hardly any taker for such costly shawls, he adds. Instead of Jamawar shawls, which originated in Srinagar and which used to be made on handlooms, shawls are now prepared on imported electronic Jacquard. The large–scale production of electronically-made shawls has drastically reduced the prices of the shawls. 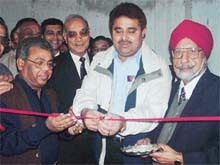 Mr Piara Lal Seth was probably among the first to import the electronic machinery. According to experts, many shawl manufacturers have been compromising on the quality of the shawls, while offering competitive prices. The prices of such shawls have come down drastically. A large number of locals, especially girls, have now adopted this profession though they cannot ensure the good quality of the traditional Kashmiri shawls. Mr J.S.Madan, Chairman, Shawl Club (India): "The local shawl industry which was in disarray due to militancy has regained its past glory. Now, it is the moral duty of the manufacturers and the traders to have fair deals with foreign buyers." Dr S.K. Chaudhury, Area Director, India/South Asia, Woolmark: "The recent export boom in shawl industry has given impetus to the local traders and manufacturers. The quality of the production has to be improved. There are many countries, including the USA, which could be even bigger markets for the local shawls. We cannot fool the foreign buyers for a long time." Mr Amrit Lal Jain, President, Punjab Pradesh Beopar Mandal: "The business can flourish only if credibility is maintained. Amritsar industry should set an example by exporting high-quality products." Mr Om Parkash Soni, Chairman, Punjab State Industrial Corporation: "The cooperation of genuine manufacturers and traders should be sought to put an end to unscrupulous practices." About 550 students of Senior Study School here recreated on stage the life of Mahatma Gandhi. These students, though under-11, were confidence personified. It was a rare treat for parents and family members of the students to watch the latter enact the life of Mahatma Gandhi. No professional was involved in the play. Only the principal and the teachers of the school were associated with it. Directed by Ms Kanchan Mehra, the play was divided into three parts. The first part was about the birth and the marriage of Mohan Das at Porbandar and Rajkot, respectively. To enact this part and impart a reality touch to it, actors were attired in typical Gujarati dresses. Ishan, a class II student, played the role of the little Mahatma very effectively. Manreet, a class VI student, enacted the role of Putli Bai, the mother of the Mahatma. The classroom scene, in which the teacher of Mohan Das, played by Muneet, a class VII student, was full of laughter. The second act depicted the stay of Mahatma Gandhi in England and South Africa, where he became Mahatma from Mohan Das. His arrival in South Africa was shown through a tribal dance performed by the students. The last part of the play delineated the arrival of Mahatma Gandhi in India and his struggle for India's independence. It was made lively by the presentation of classical Indian dances, including Kathakali and Bharatnatyam. The short and well-rehearsed dialogues, along with movements of hands and facial gestures, made the play engrossing. Ms Kanchan Mehra, Principal of the school, said that the idea behind the play was to help the students imbibe the qualities of the Father of the Nation, who had shaped the destiny of the country. The play was organised on the occasion of the 20th annual prize distribution function of the school. Mr P. I. Sabu, Regional Officer of the CBSE, Chandigarh, presided over the function. According to the BSF records, two Indian nationals were also killed while crossing over to Pakistan. However, the number of arrests had decreased considerably this year. As many as 171 persons were nabbed this year, as compared to 207 intruders during the corresponding period the last year. The nabbed persons included 56 Indians, 48 Pakistani nationals and 65 Bangladeshis, besides two intruders belonging to other countries. As per the data, the BSF had seized 21 kg of heroin smuggled from the Pakistani side to the Indian territory since January this year, as compared to 13 kg last year. It had also seized Indian currency worth Rs four lakh, besides two magazines and two rifles. The BSF authorities revealed that they also worked for the betterment of the population in the border areas. They said the BSF had adopted two schools at Muthian Wala and Amarkot villages in Ferozepore sector. It provided books and stationery to students hailing from weaker sections. The BSF is managing 553-km-long borders in the four sectors - Gurdaspur, Amritsar, Ferozepore and Faridkot. This border is fully fenced and illuminated with floodlights. The BSF authorities said that they were also associated with imparting job-oriented training to widows in family welfare centres and that 36 PCO booths in various sub-sectors of the Punjab Frontier were functional for the rehabilitation of the families of martyrs. This poet has three books of ghazals to his credit, including Kalia Dhupa, Shabda Di Valgan and Purvashi. Another book Mijrab and an unnamed book of ghazals are under publication. But the hobby of collecting historically important things makes him different from other literary figures. A government teacher by profession, Dard also has the hobby of gardening. He has more than 1000 varieties of rare and beautiful cacti. These include Astophytum, Gemnogalasium, Mamlarias, Agaves, Opancias, Howarthias, Pachipoudiums, Odaniums, Melos, Echinos Cactus and Ferro Cactus. 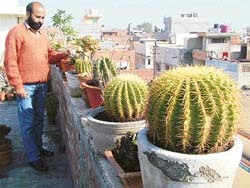 He even used grafting technique to grow a new kind of cactus. 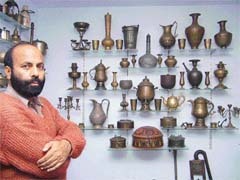 He keeps his collections in a specially constructed room at a private school located in the Islamabad area here. He says he decided to keep these collections in the school so that students could know about their rich culture and heritage and the history of their country. He says it took about 25-30 years to have this collection. Sometimes, he had to borrow money to purchase these things. The most fascinating antiques include about 200-year-old idol of 'Menka' (a mythological character), a unique folding metallic glass, a 400-year-old metallic urn, a 150-year-old typewriter still in working condition and models of steam engines. His collection of coins includes 3000-year-old silver and copper coins belonging to the early Kushan period, Gupta period, Mughal period, Sultan era and Brahmani and Malvi periods. This collection also has coins belonging to the period of Maharaja Ranjit Singh, coins of Suri and Khilji dynasties and Sindhi coins. He also has earthen utensils of the Greek period. His collection has historical significance, as the area of Amritsar district had come under the Greek influence in 326 BC and the area of Punjab, up to the banks of the Beas River, was conquered by Alexander. This poet has about 70 handwritten manuscripts, including Damodar Heer, Pandu lippi, Hikmat De Granth and manuscripts of poets during the times of the Sikh Gurus, stone-printed books and books written in Sanskrit language. When asked about his inspiration, he says that during his childhood, his parents sold off a glass with beautiful engravings to a junk dealer. He found it rather painful. In his efforts to find the junk dealer, he found many other valuable antiques and he became interested in collecting these items. He says it's unfortunate that people unknowingly sell off antiques to junk dealers. The society's objective is apparent from its name tarak (logic). It wants to inculcate the habit of logic and reason in society. It is against all kinds of sham, pretence and hollow practices devised to cheat gullible persons, say society members. It recently raised the issue of reporting in a section of media the existence of 'soul' of Sepoy Harbhajan Singh, who slipped to death some 36 years ago near the Indo-China border. Mr Sumeet Singh, media head of the society, said that the army had been working on the basis of rumours and had not taken any scientific and reasonable argument to buttress its claim. He said a delegation of the society had met the family members of Harbhajan Singh and talked with them about the matter. He also said that the society had found that the family members had not seen any movement, which could prove that Harbhajan Singh returned home, slept on the bed and took meals with them. Mr Sumeet Singh said Mr Megh Raj Mitar had formed the society in 1984 on the basis of philosophy of Dr Ibraham T. Kavoor's books, "Be Gone God Men" and "God, Demons and Spirits". He said both books were translated into Punjabi. The society followed the 51-A (h) clause of the Indian Constitution, which clearly mentioned: "It shall be the duty of every citizen of India to develop scientific temper, humanism and the spirit of inquiry and reforms", he added. The society publishes literature and magazines to expose the unscientific and unreasonable practices. To sensitise people about the issue, the society had even announced to give Rs 5 lakh to the person who could perform "magical" and "unworldly" feats in front of science experts. Members of the society also organise plays with scientific themes to educate rural as well as urban masses about the 'reality' of superstitions. The spirit behind this project has been the Secretary of the mission, Mr Avinash Mahindru, who felt inspired by a similar group of social workers in Ludhiana. Giving details of the mission's monthly-ration scheme, Mr Mahindru said that in 2001, he, along with the members of the mission, had launched this social project with the blessings of the Head of the World Chinmaya Mission, Swami Tejomayananda. He said that they invited applications from widows and then the task of checking the antecedents of the applicants without favour or prejudice was undertaken. They initially selected 100 young widows who needed immediate relief. The task of arranging the ration, which included rice, wheat flour, pulses, spices, soap, tea, sugar and other essential household items, every month turned out to be the most difficult part of the ration scheme. However, the public response to this project was heartening and a large number of philanthropists and volunteers pooled in their resources to make the scheme successful, Mr Mahindru added. He said that till last month, 29 monthly-ration distribution functions had been organised at S. L. Bhavan, Bhartiya Vidhya Bhavan School. He complimented a number of educational institutions, including Bhartiya Vidhya Bhavan, DAV Public School, Senior Study School, BBK DAV College for Women, along with fruit and vegetable commission agents and Punjab Rice Mills' Exporters Association, for contributing regularly for this noble cause. Having visited many villages, including those in Jalandhar, Moga, Ludhiana, Kapurthala and Gurdaspur, he is now on visit to villages of Amritsar and Tarn Taran. Talking to this correspondent, he claimed that in the past six years, he had visited at least 1600 villages and convinced about 6500 villagers to donate their eyes. He said he walked about 10 km daily for this purpose. "Walking also helps me to remain healthy", he quipped. He started his mission in 1998 after inspiration and encouragement from Mr Ujjal Singh, President, Bhai Ghanaiya Charitable Trust in Hoshiarpur. "Initially, I found it hard to motivate people. Though they appreciated my work, they were reluctant to pledge their organs for donation." But he was not the one to give up. Perhaps, the best part is that this man not only preaches, but also practises what he tells others to do. In 1998, he pledged his body for donation to the Sri Guru Ram Das Institute of Medical Sciences at Amritsar. "In my will, I have mentioned that no rituals, apart from the Japuji Sahib Path, be performed after my death," he said. Mr Sampuran Singh shifted from Patna to Hoshiarpur in 1984, at the time of the anti-Sikh riots. He opened a bakery shop for his living. He said it was the sight of visually challenged persons begging in streets that made him devote his life to the cause of "spreading light" about eye-donation. Initially, his family resented his efforts, but gradually they learnt to appreciate his work. Mr Bodani said that these jewellery items had been showcased for public. A large number of the city's elite was present at the showroom to take a look at some of the exquisite diamond jewellery items designed by top designers. The business executive, however, did not reveal the prices of these items. He said that these items were not for sale. These teachers had been transferred with the assurance that they would be shifted back to Amritsar medical college after the completion of the inspection at Faridkot. But till date they continue to serve at Faridkot. That these teachers are also the guides of the postgraduate students has further affected the education in this reputed medical college. The college has already been facing serious trouble due to the non-recruitment of new teachers against the vacant posts. About 50 per cent posts of teachers are reportedly not filled in the college. The postgraduate students rue that they would be unable to complete and submit their theses, as their guides have been transferred to Faridkot medical college. A student, on the condition of anonymity, said that due to the non-submission of theses, they would not be allowed to sit in examinations. He said the absence of the majority of the teachers had badly affected their study. "The students are a confused lot today. Changing their guides at this stage would not be feasible," he added. Due to these transfers, a number of units of various departments had been closed or were on the verge of closure, said a teacher, preferring anonymity. He said the worst affected was the cardio-thoracic surgery department. The only teacher, Dr Kuldip Singh Siddu, had been shifted to Patiala on the pretext of 'inspection', even though there was not any such department there, he added. He said many units of surgery and medicine had already been closed due to staff shortage. He said as per the MCI guidelines, senior lecturer and assistant professors of any clinical department, including medical surgery and gynaecology, could not head the unit independently. However, due to these transfers, senior lecturers and assistant professor were heading the units. This was against the guidelines of the MCI. "What would be the fate of the college if the MCI team inspects this college now?" he questioned. Representatives of the Punjab Medical and Dental Teachers' Association who had raised the matter a number of times with the authorities concerned, alleged that the state government seemed unbothered about the medical education. However, Dr J.S. Dalal, Principal, Government Medical College, and Director, Research and Medical Education (DRME), could not be contacted for comments despite repeated attempts. He worked as census clerk in Tarn Taran when the census operations were in progress. A letter from the Directorate of Census Operations, Punjab, under the Ministry of Home Affairs, mentioned that it was the convention in the census organisation to award President of India's census medals to the selected census functionaries for their quality service. The letter also said that the Census of India-2001 operations in Punjab were carried out in two phases - House Listing Operations in May 2000 and Population Enumeration in February 2001. It was the first census of the 21st century. In the state alone, 50,000 odd enumerators and supervisors were deployed for enumerating 243 lakh persons in about 34 lakh households. Nevertheless, some shopkeepers in the Cooper Road area reportedly enjoy 'special' privileges. Despite the whole city facing power cuts, this 'special' area reportedly with the connivance of some senior officials of the Punjab State Electricity Board (PSEB) enjoys benefits of uninterrupted power supply. During power cuts, which are in force during mornings, afternoons and evenings and also at nights, about 30 shopkeepers in the area reportedly enjoy the 'special' privilege. However, these shopkeepers have learnt to ward off any complaint against them by claiming that they possess battery inverters. Sources, however, reveal that the power supply is received from a 'hotline' from the nearby government-run Vijay Hospital. This practice has been continuing for the past few years, add sources. A senior official, when approached by a shopkeeper who was 'deprived' of the 'facility', was told that a transformer would be installed soon. Chief Engineer, PSEB, Mr R.C. Jaiswal, when contacted, said he would send a PSEB team to ascertain the facts. If the power supply was unauthorised, a punitive action would be taken, he added. Executive Engineer Tilak Raj said he would immediately check the area and take a suitable action.